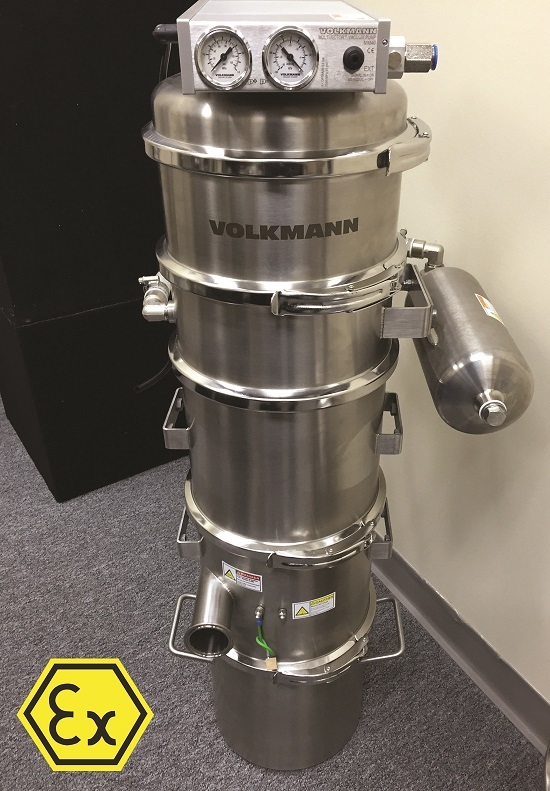 Volkmann offers standalone or integrated “all 316L” high-containment dust collectors and vacuum cleanup conveyors for simple and effective dust collection, dust cleanup, or as a dust collector for a bag dump station. They are capable of handling dry, semi-dry, or liquid cleanup, including dense metal powders such as those used in 3D metal printing. Slurry applications, cuttings from machine tools, and cleanout of brake lining molds, as well as many other unique applications have all been undertaken. Available in 10-, 14-, and 18-in.-diam, the VSHC units provide effective dust control that meets ATEX Certified and explosion-proof standards for any powder having a Minimum Ignition Energy (MIE) of greater than 1 mJ. The units are manufactured in all 316L contact parts and feature both patented modules for tool-free cleaning and filter system, as well as common seals throughout. Noise levels of 76dBA provide quiet operation. The units also feature a filter-cleaning system that back pulses the filter at the simple turning of the on/off pump switch, resulting in longer use without the need to clean filters. The VSHC units incorporate a 0.3 micron Quick Exchange filter as standard with optional HEPA filtration and a variety of hose size options and custom designed hoods or pickup tools, to suit specific applications.